Flexible Foam Market size valued at over USD 35 billion in 2018 and is anticipated to witness over 7.5% CAGR up to 2025. Shifting consumer buying patterns along with increasing inclination towards enhancement in the interior design of cars are among the key factors propelling flexible foam market expansion over the forecast period. Increasing global vehicle production along with growing use of the product in seating’s, armrests and other vehicle parts is also anticipated to boost the product demand. Also, growing furniture demand owing to increasing disposable income coupled with benefits such as enhanced cushioning and durability in the protection of packaged products will further support the flexible foam market growth. Rising implementation of the government initiatives in the U.S. and Canada such as the Zero Energy Buildings (ZEB) for reducing energy consumption on an annual basis is expected to fuel demand for the thermal insulation which will further steer flexible foam market growth. For instance, the U.S. DOE Zero Energy Ready Home National Program has set standard criteria according to the International Energy Conservation Code. The building codes have a criterion to qualify in the national program initiatives through the constructing of energy-efficient buildings with an efficiency in between 40 and 50 percent as compared to other houses. Technological advancements including development of the product using bio-based materials, allowing efficient insulation, easy installation methods along with use of excellent soundproof thermal insulation materials in roof and walls applications of buildings are stimulating the industry growth. Growing focus of manufacturers on developing lightweight and fuel-efficient vehicles coupled with the replacement of the rubberized hair and cotton materials with lightweight foams in the furniture & bedding industry will further drive the flexible foam market demand for the product over the projected timeframe. New building constructions with improved energy-efficient solutions along with increasing demand for memory and viscoelastic foam in bedding and mattress products will drive the market in both developed and developing economies. Favorable government regulations for improving energy efficiency in commercial & residential buildings to prevent loss of natural resources will proliferate the flexible foam market landscape. Growing demand for lightweight and moldable packaging materials in the consumer goods along with increased importance for safety during shipping and transportation will propel the demand for flexible foam in the packaging of consumer goods. However, stringent environmental on hazardous emissions produced during the fabrication of the product along with restrictions on the use of raw materials such as MDI and TDI will hinder market growth. For instance, the U.S. Environmental Protection Agency has the National Emissions Standards for Hazardous Air Pollutants (NESHAP) relating to the hazardous emissions produced during the fabrication of flexible foam products. Polyurethane dominated the flexible foam market and accounted for over 60% of the overall demand in 2018. Key features such as lightweight enhanced cushioning and sealing, improved thermal insulation, environmental benefits including recyclability, reduction in wastage, and higher sustainability will augment the product demand. Properties such as superior resistance to moisture and heat, excellent thermal insulation and protection against corrosion will make the product ideal for construction applications in the roofs and walls of buildings. Polyethylene accounted for more than 25% of the total flexible foam market share in 2018. Key features such as lightweight, high resiliency, superior resistance to tearing, cracking, and crumbling will fuel the product demand. Increasing construction business in both residential and commercial sector owing to various city & town modernization and development plans in both developing and developed nations will steer the product demand. Strong application scope in building & construction, protective packaging, automotive and medical sector will proliferate the industry expansion. Furniture & upholstery end-use segment accounted for over USD 10 billion in 2018. Increasing disposable income in developing nations coupled with shifting consumer buying patterns owing to changing lifestyles will stimulate the demand for furniture & upholstery which in turn will fuel the flexible foam market demand. Rising investments in residential construction supported by technological advancements offering highly resilient, durable, air permeable and lightweight furniture are propelling the industry growth. 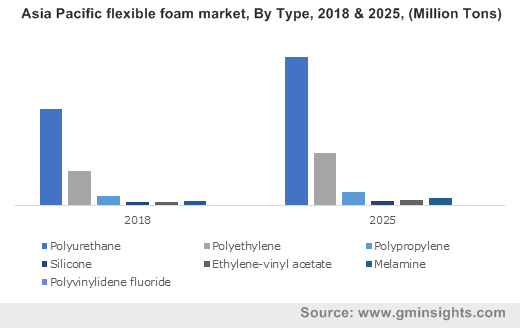 Increasing demand for memory and viscoelastic foam in bedding and mattress products will further drive the product demand in both developed and developing economies. Transportation end-use segment will witness gains at over 8% CAGR in terms of volume up to 2025. Growing transportation industry particularly in automotive & aerospace owing to increase in disposable income, strong economic growth, rise in count of tourists supported by increasing consumer spending on leisure & experiences are among the key factors driving the flexible foam market landscape up to 2025. Also, extensive usage for the cushioning of seats in public transportation such as buses, trams, trains, and taxis will drive the market share over the forecast period. Asia Pacific is projected to be the dominating region in the overall flexible foam market over the forecast time frame. The surging demand for the product from the diverse end user industries present in the region such as furniture, packaging, consumer goods and automotive will influence market growth. Increasing green building technologies penetration in construction sector along with rapid growth in the automotive industry will boost the regional growth. China is expected to dominate the market in the region owing to the increased foreign direct investments in the country. For instance, as per the World Investment Report, the FDI inflows in China increased from USD 133 billion in 2016 to USD 136 billion in 2017, making China the second largest FDI recipient in the world. 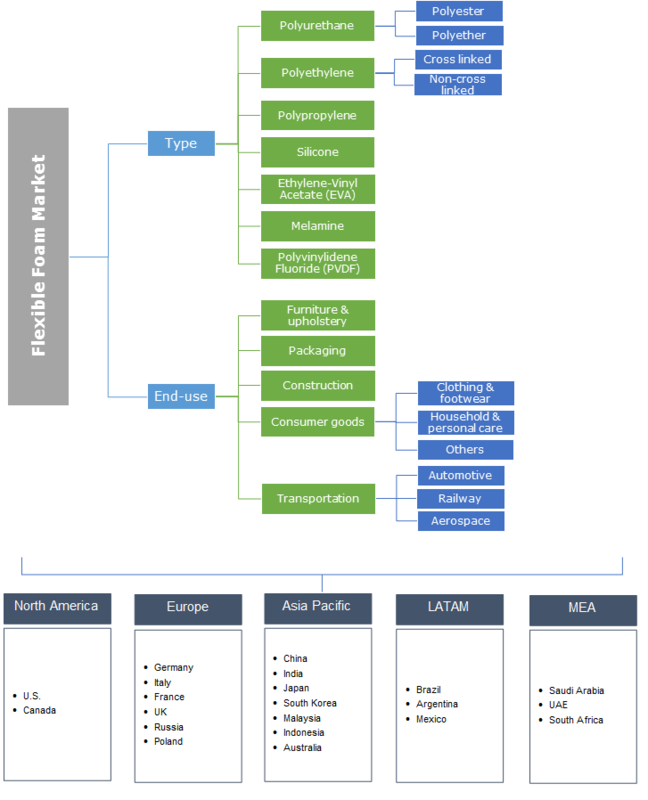 Latin America accounted for over 8% of the overall flexible foam market share in 2018. Surging demand from the automotive industry coupled with rapid urbanization and industrialization in the region will steer the demand for the product during the forecasted timeframe. Moreover, growing demand for the demand from the consumer goods sector along with rapid industrialization in countries such as Mexico and Brazil will further promulgate the overall market growth across the region. The flexible foam market share is highly fragmented owing to the presence of many global and regional players. Key industry participants include BASF, Covestro AG, Huntsman International, Dow Chemical Company and Recticel. They rely on strategies such as mergers & acquisition, product development, geographical expansion, technological innovation and sourcing strategies to enhance their industry share. For instance, in March 2015, BASF announced to launch Basotect flexible polyurethane foams that can be used to produce lightweight engine coverings with one-shot process reducing the lead time required. Global flexible foam market is driven by technological advancements and rapid innovations in the construction and automotive sector. Moreover, growing population along with rising furniture demand owing to trend towards lightweight, durable and temperature control seating will promulgate the industry growth. Moreover, developing economies such as India, China, Brazil and Mexico will significantly impact the product development owing to large potential customer base coupled with inclination of individuals towards luxurious interior products and modern building installations.